Hey Glam Puzzlers! 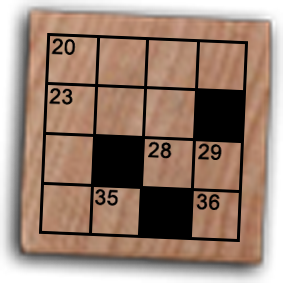 Welcome to the ALL feature – AL’s Puzzles. Play a new jigsaw puzzle, crossword, word search and Adamoku (Sudoku) each month! The puzzle page is back but will only be monthly now – unless Adam goes on tour again. While I had some time, I submitted some crosswords to professional crossword publications and I got a few crosswords accepted by the NY and LA Times. Some were already published this year! Just recently, I was looking at a crossword review of my most recent puzzle on a NYT crossword blog and the header featured The Original High. Two of my passions coming together on the same page! If you would like a hard copy of one of my NYT or LAT crosswords, please email me (link under “NEED HELP?”). I can send you a copy after the crossword has been published. The puzzle page is back but will only be monthly now - unless Adam goes on tour again. While I had some time, I submitted some crosswords to professional crossword publications and I got a few crosswords accepted by the NY and LA Times. Some were already published this year! Just recently, I was looking at a crossword review of my most recent puzzle on a NYT crossword blog and the header featured The Original High. Two of my passions coming together on the same page! :yes: If you would like a hard copy of one of my NYT or LAT crosswords, please email me (link under "NEED HELP?"). I can send you a copy after the crossword has been published. AL, that is wonderful!! We knew you were talented – I was just re-admiring your Ste Agathe puzzle again last evening, I have printed it and had it laminated as another souvenir of the concert – but had no idea that you were THAT talented! And you have been so generous to us! This is really fun! And, congrats on getting recognized by the big newspaper kahunas of puzzledom (as far as I know anyway). ETA: puzzle time 6 min, and maybe 40 seconds? This is really fun! And, congrats on getting recognized by the big newspaper kahunas of puzzledom (as far as I know anyway). Thanks so much AL! ETA: puzzle time 6 min, and maybe 40 seconds? Fun! Hey AL, congratulations!!! So happy for you! We are so fortunate!! Thanks for everything. Love your new avi …. Very cute … OH! and you too! It took me 17:38 mins to finish the puzzle. Excellent news, AL!! Thanks for sharing! And thanks for bringing back the crossword and other puzzles!! Did the jigsaw in 6:06! Excellent news, AL!! Thanks for sharing! And thanks for bringing back the crossword and other puzzles!! Did the jigsaw in 6:06! Am gonna work on the puzzles tomorrow! Did jigsaw in 4:42. Thanks, AL!! Thank you AL so much for these great puzzles! Just did the jigsaw puzzle in 4:21. Thanks so much, AL, for spoiling us so! Boy, was I slow at 7 minutes something, but I had a great time (as always) putting “shower” pic together. Boy, was I slow at 7 minutes something, but I had a great time (as always) putting "shower" pic together. Thanks again, AL :star: ! Thank you AL, I really look forward to these puzzles, they are such fun! renogal, thanks for the compliment! Glad you like them! Going to the Las Vegas show on Saturday? renogal, thanks for the compliment! Glad you like them! Going to the Las Vegas show on Saturday? Loved the crossword, AL, you make it easy (and really fun) for us. This is the first I’ve tried…May have to work up the the ones you do for the NYTs, though. Glad its a bit simpler here! Loved the crossword, AL, you make it easy (and really fun) for us. This is the first I've tried...May have to work up the the ones you do for the NYTs, though. Glad its a bit simpler here! Thanks so much! Are there any previous jigsaw puzzles anywhere? and uploading an image. You can solve the puzzle on their site. I just embed a new one each month here but I guess I could save the link in the archives. Please let me know if that is something that you would like. HK fan, I never save the previous jigsaw puzzles but it's easy to create your own by going to this website http://www.jigsawplanet.com and uploading an image. You can solve the puzzle on their site. I just embed a new one each month here but I guess I could save the link in the archives. Please let me know if that is something that you would like. Thanks so much, AL, for continuing with these puzzles. Just did the jigsaw puzzle on my phone. I’m a bit rusty! Took me 7:33! Thanks so much, AL, for continuing with these puzzles. Just did the jigsaw puzzle on my phone. I'm a bit rusty! Took me 7:33! Did the crossword puzzle too!! Loved this month’s puzzle. Thanks, AL! Loved this month's puzzle. Thanks, AL! Your puzzles are the first thing I check out on the first day of every month. Thank you AL!